Austrian lighting group Zumtobel announced its lighting project for the new Town Hall in Freiburg, Germany. Cooperated with ingenhoven architects, Tropp Lighting Design and the City of Freiburg authorities, Zumtobel helped the building to generate more energy than it actually uses. 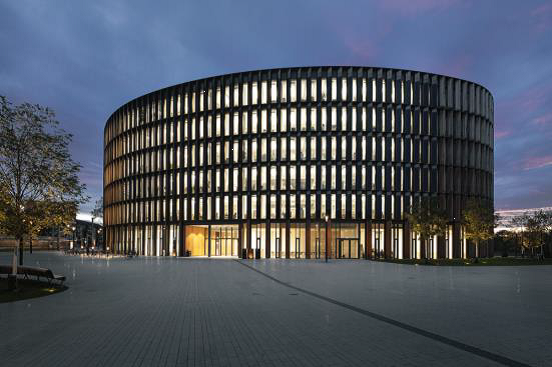 Thanks to the project, the Freiburg Germany, an oval shape, sit-story building, has a façade with slender storey-high slats that stretch around the building. A façade with slats that are light larch wood on one side and full-scale photovoltaic panel on the other presents a stylish and functional design with pioneering energy efficiency. 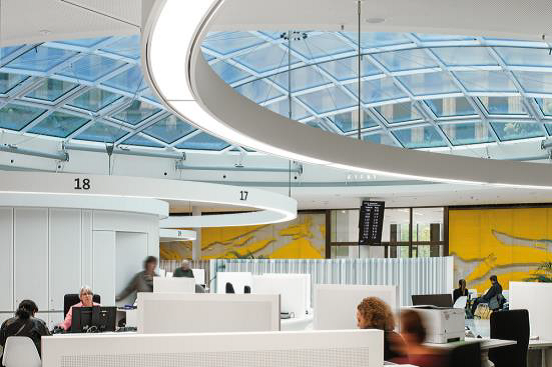 Through the partnership with ingenhoven architects, Tropp Lighting Design and the City of Freiburg authorities, Zumtobel adopted customized energy-efficient LED lighting solutions for the offices, the Public Service Centre and the canteen. These solutions have also played a major role in enabling Freiburg Town Hall to become Germany's first net plus-energy administration building. The LED solutions provided by Zumtobel provide glare-free light with its multilayer luminaire structure incorporating a diffuser and micro-prismatic optics. The increased color rendering index (CRI) of more than 90 guarantees maximum light quality and color authenticity. Achieving this perfect blend of architecture, design and light to deliver the highest standards of well-being, design and energy efficiency have helped Freiburg Town Hall become Germany`s first net plus-energy administration building.